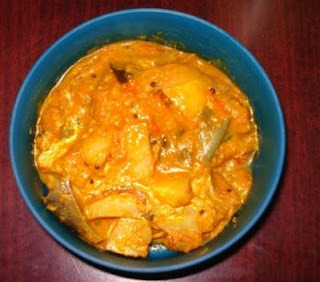 Vankai Urulagadda Kura or Brinjal Potato Curry as it can be called is a very simple yet tasty curry that goes as an excellent combi for Chitramma and of course with Rotis. But the strangest part was accepting the fact that at my in-laws place, they eat this with Sweet Polis or Puran Polis as its commonly known as. I have already given an insight to the place Polis holds at our place, should find time to prepare and post it. But we all had our shock, we in sense my parents and me, when we first came to know that my in-laws eat Polis with this Sabji. Its very famous at their place. As I said they prepare Polis for all festivals and this is the side dish they prepare. This is also the side dish they prepare for Chitramma or Lemon Rice. But there was this secret ingredient that I came to know that they add to this that gives the special taste. Chop Brinjal and Potatoes into 2 " cubes. Finely chop onions and tomatoes. Heat a kadai with Oil, add the seasoning items. Then sauté in Onions and curry leaves. Once they are light brown in colour, add potatoes and brinjal. Simmer and cover with lid to cook well. This way both the vegetables get cooked. Then add tomatoes and all the powders. Fry on high flame and then add the Kopra and garlic paste. Add water and simmer for 15 mins or till both are cooked and tender. Garnish with chopped coriander leaves. The photo shows my lunch box, I made this sabji with Lemon rice, since I have already posted that, just took the sabji part. To be frank, I have come to love the combi of Sweet polis with this sabji. It has an unique taste to the entire stuff. Now coming to awards. Since the past few weeks, its been raining awards in the food blogsphere. It feels good to get awards. I was happy getting to know the others who got these awards. I felt happy though I doubt it is deserving when I found myself being mentioned by my dear blog friends who never fail to encourage me. Its Archana and Cinnamon. Thanks for remembering and thinking I deserve these. I think the entire community deserve to be awarded, but since I need to mention few names, I take pleasure in mentioning them in no particular order. Most of them have already received these awards...still this is my way of saying they rock! These are few bloggers who always take time to comment on my posts. If I don't see their comments in even one, I feel like asking them for their valuable comments. Asha.....the ever rocking gal...not sure how she finds time to comment and encourage everybody. Bee .. If you think only gals rocks, you are wrong...here comes a bunch of guys who equally rock! Joseph My very own award to Jai & Bee's Jungalbandi as the Most Witty and Fun place be....they simply rock and I never miss a day to read their blog...it lightens the mind and heart to read what they write....Jai & Bee kindly accept this from me. Thanks for all the encouragement. Enjoy!